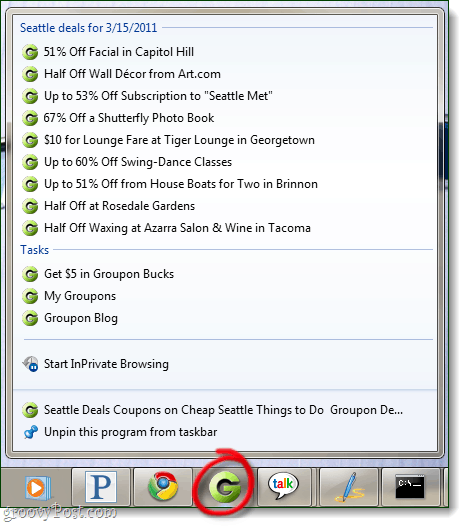 Microsoft is going all out in promoting IE9’s new taskbar pinning feature. In doing so they’ve teamed up with some of the big names on the web in presenting special offers to Internet Explorer 9 users. To be eligible for these offers, the conditions are simple: pin the participating website to your taskbar, and use the IE9 jump-list links to activate your free offers. You could earn yourself a free month of premium Hulu, or even an Xbox 360. Starting on March 28th 2011, if you sign up for Hulu Plus through a pinned Hulu IE9 window you will receive one your first month free. 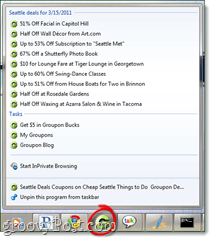 The first deal that you buy through a pinned Groupon IE9 window will earn you $5 in Groupon Bucks. The jump-list will also display all of the currently active local deals. During the whole month of April earn 8% additional eBay bucks on any purchases made using a pinned IE9 window. In the month of May you can earn $5 off your first purchase. At any rate, I think the taskbar pinning website feature of IE9 is rather groovy! An expert-level power user won’t ever need to use a pinned website, but it will definitely come in handy when you are teaching your mom how to use the internet. Microsoft is really riding on this pinning feature being the “next big thing,” and they might be right. The question is, is IE9 going to have a high enough adoption rate to make this take off?